Anthony Ray Swarzak (born September 10, 1985) is an American professional baseball pitcher for the Seattle Mariners of Major League Baseball (MLB). 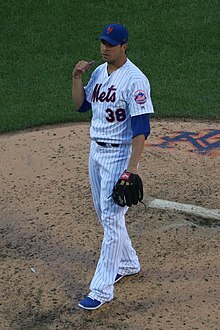 He previously played for the Minnesota Twins, Cleveland Indians, New York Yankees, Chicago White Sox, Milwaukee Brewers, New York Mets, and for the Doosan Bears of the KBO League. Swarzak attended Nova High School in Davie, Florida. As a sophomore, Swarzak pitched to an 11–1 win–loss record with a 1.16 earned run average and 120 strikeouts and was named to the All-County team and second team All-State. In 2003, he finished 14–1 with 142 strikeouts. In his senior season, in which he went 14–2, with 147 strikeouts, Swarzak was named to the 2004 All-County and Class 5A All-State teams. He had committed to attend Louisiana State University (LSU) to play college baseball for the LSU Tigers, but instead chose to sign with the Twins on June 22, 2004, for a $575,000 bonus. The Minnesota Twins selected Swarzak in the second round, with the 61st overall selection, in the 2004 Major League Baseball draft. Swarzak was #15 on the Baseball America Top Gulf Coast League Prospects list in 2004. He was Midwest League Pitcher of the Week (from May 16–22, 2005), the Twins' Pitcher of the Month (May 2005), Midwest League All-Star, and #8 on the Baseball America Top Midwest League Prospects list in 2005. In 2006, he was Florida State League Pitcher of the Week (from August 7–14, 2006) and a FSL Post-Season All-Star. Swarzak was one of the top rated prospects in the Twins' farm system before a fifty-game suspension for violation of Minor League drug policy on April 20, 2007 sidetracked his career. He tested positive for marijuana. After having started the season with the Double A New Britain Rock Cats, upon his reinstatement from the restricted list on June 11, he was reassigned to the Class A Advanced Fort Myers Miracle. After three games with Fort Myers, he returned to New Britain. He began the 2008 season with the Rock Cats, and went 3–8 with a 5.67 earned run average. After a promotion to Triple-A, his record actually improved to 5–0 with a 1.80 ERA in seven starts. He was added to the Twins' 40 man roster, and spent his first spring with the Twins in 2009. Following Spring training, he was reassigned to Rochester. Swarzak suffered from a lack of run support in Rochester to start the season. Despite an ERA of 1.59 in his first three starts, his record stood at 0–3. His record improved to 3–4 with a 2.25 ERA when he got the call to the majors on May 20. He filled in the starting rotation for the injured left-handed starter Glen Perkins. Swarzak made his major league debut for the Twins on May 23, 2009 in a home game against the Milwaukee Brewers. He pitched seven shutout innings, giving up five hits and two walks while striking out three. The Twins won the game 6–2, earning Swarzak his first major league win. After a line drive broke his foot, Swarzak's 2010 season was statistically awful as he spent the whole year in the minors. His ERA finished at 6.21 in AAA Rochester. Swarzak rebounded in 2011, contributing both in long relief and in spot starts for the Twins. He pitched a total of 102 innings, going 4–7 in 27 games. In 2012, Swarzak started five games for the Twins while making 39 appearances out of the bullpen, pitching to a collective 96 innings of work. Swarzak began 2013 on the disabled list with fractured left ribs he suffered while "wrestling around a little bit." He was activated on April 7 and used primarily as a long reliever for the rest of the season. In 48 games, he went 3–2 with a 2.91 ERA, striking out 69 in 96 innings. On November 25, 2014 the Twins announced that Swarzak had been outrighted off the 40-man roster and elected free agency. He was released in May and signed with the Doosan Bears of the Korea Baseball Organization. Swarzak filled the foreign player roster spot formerly held by Yunesky Maya. He worked mainly as a starting pitcher in Korea and added a slider to his arsenal of pitches. Swarzak signed a minor league contract with the New York Yankees on February 5, 2016. He began the 2016 season with the Triple-A Scranton/Wilkes-Barre RailRiders, and was promoted to the major leagues on June 7. At the end of the season, Swarzak elected free agency over an assignment to Scranton/Wilkes-Barre. On January 23, 2017, Swarzak signed a minor league contract with the Chicago White Sox. On July 25, 2017, Swarzak was traded by the Chicago White Sox to the Milwaukee Brewers for outfielder Ryan Cordell. Swarzak signed a two-year contract with the New York Mets on December 15, 2017 worth over $14 million. On April 3, the Mets placed Swarzak on the disabled list with an oblique strain and recalled Hansel Robles. Swarzak was activated from the disabled list on June 5 after appearing in three rehab games with the Triple-A Las Vegas 51s. On December 3, 2018, the Mets traded Swarzak, Jay Bruce, Jarred Kelenic, Gerson Bautista, and Justin Dunn to the Seattle Mariners for Edwin Díaz, Robinson Canó, and $20 million. On March 19, 2019, Swarzak was placed on the disabled list with a right shoulder impingement. ^ Cabrera, Christy (June 8, 2004). "Twins Draft Nova's Swarzak In Second Round". Sun Sentinel. Retrieved February 8, 2016. ^ "Broward, Palm Combine To Place 9 On First Teams". Sun Sentinel. June 7, 2002. Retrieved February 8, 2016. ^ Cabrera, Christy (February 18, 2003). "System Of Success". Sun Sentinel. Retrieved February 8, 2016. ^ "Players Commit To Division I Colleges". Sun Sentinel. November 12, 2003. Retrieved February 8, 2016. ^ a b Lammer, Patrick; Cabrera, Christy (June 22, 2004). "Twins Come To Terms With 2nd-round Selection Swarzak". Sun Sentinel. Retrieved February 8, 2016. ^ Robb, Sharon (June 19, 2004). "Nova Places Two On Class 5a All-state First Team". Sun Sentinel. Retrieved February 8, 2016. ^ Blustein, Larry (April 23, 2004). "Titan Trio Draws Big Guns". Sun Sentinel. Retrieved February 8, 2016. ^ Puleo, Tom (April 21, 2007). "Cats' Swarzak Suspended For Drugs". Hartford Courant. Retrieved February 8, 2016. ^ "Swarzak honored". Beloit Daily News. June 3, 2005. Retrieved February 8, 2016. ^ Hand, Brian (June 14, 2005). "Midwest League Notebook". MILB.com. Retrieved February 8, 2016. ^ Hill, Benjamin (August 14, 2006). "Pitchers of the Week". MILB.com. Retrieved February 8, 2016. ^ Zimmerman, Kristen (August 28, 2006). "Yankees prospects honored by FSL". MILB.com. Retrieved February 8, 2016. ^ "Swarzak grateful for second chance". Archived from the original on March 3, 2009. Retrieved April 7, 2009. ^ Reusse, Patrick (May 24, 2009). "Suspension only a bump in road". Star Tribune. Archived from the original on December 14, 2017 – via HighBeam Research. ^ Mayo, Jonathan (October 17, 2007). "Perspective: Swarzak bounces back". MILB.com. Retrieved February 8, 2016. ^ "Minor League Baseball". Retrieved April 7, 2009. ^ Neal III, La Velle E. (May 20, 2009). "Twins call up Swarzak; Breslow claimed off waivers by Oakland". Twins Insider. Star Tribune. Archived from the original on May 23, 2009. Retrieved May 23, 2009. ^ Campbell, Dave (May 23, 2009). "Mauer power: Swarzak, Twins beat Brewers 6–2". Minneapolis, Minn.: Star Tribune. Retrieved May 23, 2009. ^ "In-Progress Boxscore Milwaukee vs. Minnesota". Star Tribune. May 23, 2009. Archived from the original on May 30, 2011. Retrieved May 23, 2009. ^ "Swarzak eyes bullpen spot". Grand Forks Herald. January 31, 2011. Retrieved February 8, 2016. ^ Miller, Phil (February 7, 2013). "Swarzak injured after post-TwinsFest 'horseplay' with teammates". Star Tribune. Retrieved February 8, 2016. ^ Rupar, Aaron (February 7, 2013). "Twins pitcher Anthony Swarzak breaks ribs in one of the most juvenile ways imaginable". City Pages. Retrieved February 8, 2016. ^ Bollinger, Rhett (April 7, 2013). "Twins alter pitching staff with roster moves". MLB.com. Retrieved February 8, 2016. ^ Bollinger, Rhett (November 25, 2014). "Swarzak outrighted by Twins, to become free agent". MLB.com. Retrieved February 8, 2016. ^ "Swarzak signed to minor league deal". ESPN.com. Associated Press. January 15, 2015. Retrieved February 8, 2016. ^ Meisel, Zack (January 15, 2015). "Cleveland Indians sign pitcher Anthony Swarzak to minor league contract with spring training invitation". Cleveland Plain Dealer. Retrieved February 8, 2016. ^ Herrmann, A.J. (January 13, 2016). "Yankees sign RHP Anthony Swarzak to MiLB deal". YES Network. ^ Adams, Steve (June 16, 2015). "Anthony Swarzak Signs With KBO's Doosan Bears". MLB Trade Rumors. Retrieved December 13, 2017. ^ Hennigan, Shane (April 24, 2016). "RAILRIDERS: After playing in Korea in 2015, Swarzak, Romero and Cloyd all find themselves in Scranton". The Scranton Times-Tribune. Retrieved December 13, 2017. ^ "Kozma, Pestano, Swarzak sign minor league deals with Yanks". ESPN.com. Associated Press. February 5, 2016. Retrieved February 8, 2016. ^ "Yankees call up Anthony Swarzak, send down Luis Cessa, DFA Tyler Olson". Web.yesnetwork.com. Retrieved December 2, 2018. ^ Adams, Steve (January 23, 2017). "White Sox Sign Anthony Swarzak, Blake Smith To Minor League Deals". mlbtraderumors.com. Retrieved January 23, 2017. ^ news services, espn (July 25, 2017). "Brewers acquire pitcher Swarzak, send prospect to White Sox". espn.com. Retrieved July 25, 2017. ^ DiComo, Anthony (December 15, 2017). "Mets sign reliever Swarzak to two-year deal". MLB.com. Retrieved December 15, 2017. ^ Ackert, Kristie; Gilberg, Ari (April 3, 2018). "Mets put Anthony Swarzak on 10-day DL, recall shaky Hansel Robles". NY Daily News. Retrieved April 4, 2018.